Since MH62 can’t quite figure out THE BLOGSPOT (credit to Fat Tony for the reference), I have recruited The Hulk to discuss, post, and make general merriment on the site. 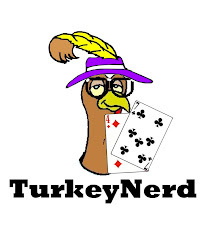 He gave us the first version of Turkey Nerd history, and his understanding of the game (both online and live cash/tournament) is excellent. I look forward to his contributions. Likewise, if Mr. Primetime chooses to contribute, that would be beautimus!